Compatibility implementations of useful nonstandard types and functions. Definition at line 27 of file compat.h. 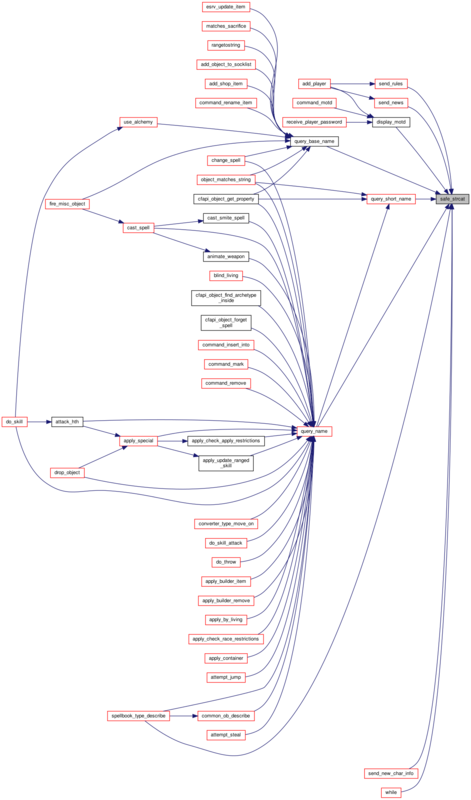 Referenced by cast_raise_dead_spell(), expand_objects(), get_archetype_struct(), include_map_in_map(), and parse_shop_string(). Definition at line 11 of file compat.h. Referenced by cctk_init_std_archetypes(), command_abil(), command_addexp(), command_create(), command_patch(), command_search_items(), command_title(), compare_ob_value_lists_one(), convert_item(), did_make_save_item(), generate_monster_arch(), generate_monster_inv(), init_library(), is_valid_faceset(), load_settings(), map_info(), metaserver2_init(), new_exp(), object_set_value(), object_set_value_s(), parse_dialog_information(), pay_for_item(), pick_up_object(), set_object_face_main(), set_object_face_other(), and spell_failure(). Definition at line 12 of file compat.h. Referenced by command_statistics(), command_stats(), describe_item(), draw_one_high_score(), dump_abilities(), dump_experience(), get_ob_diff(), get_score(), god_enchants_weapon(), init_experience(), print_monsters(), put_score(), random_roll64(), resurrect_player(), ring_desc(), and show_skills(). Definition at line 13 of file compat.h. Referenced by main(), pay_for_amount(), pay_for_item(), save_map(), and START_TEST(). Definition at line 20 of file compat.h. Referenced by add_monster(), animate_weapon(), apply_auto(), apply_death_exp_penalty(), attempt_recipe(), calc_skill_exp(), cast_spell(), check_pick(), command_create(), common_trap_type_process(), confuse_living(), die_roll(), do_exit_map(), draw_magic_map(), esrv_draw_look(), esrv_send_inventory(), expand_lighted_sight(), fix_object(), hit_with_one_attacktype(), kill_player_not_permadeath(), min_casting_level(), monster_can_detect_enemy(), monster_check_pickup(), monster_check_wakeup(), monster_use_range(), move_symptom(), new_exp(), object_merge_spell(), object_split(), path_to_player(), peacemaker_type_process(), pets_summon_golem(), poison_living(), pray_at_altar(), random_roll(), random_roll64(), recipe_chance(), rod_adjust(), roguelike_link_rooms(), scroll_type_apply(), SP_level_spellpoint_cost(), spellbook_type_apply(), spring_trap(), trap_disarm(), trap_see(), and write_scroll(). Definition at line 17 of file compat.h. 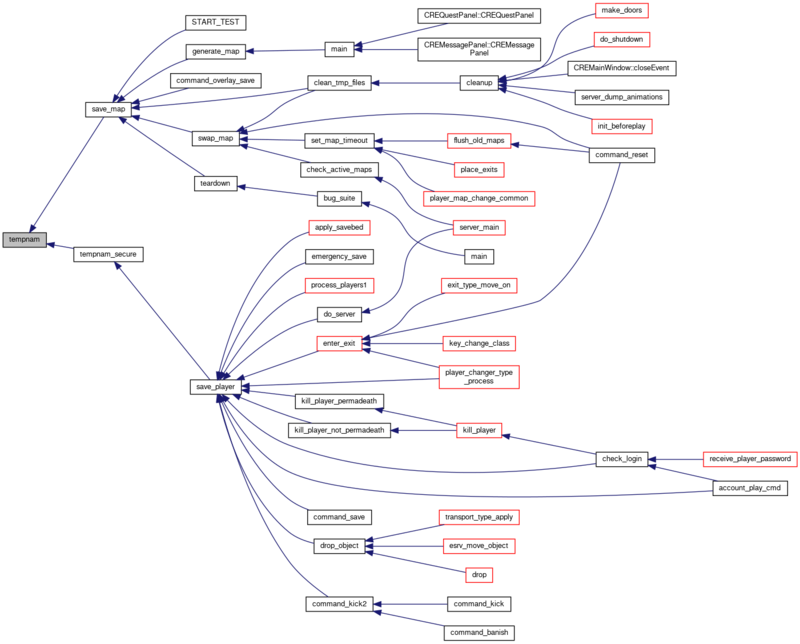 Referenced by add_monster(), apply_death_exp_penalty(), cast_bless(), check_exp_adjust(), die_roll(), do_exit_map(), do_throw(), dragon_eat_flesh(), draw_magic_map(), esrv_draw_look(), esrv_send_inventory(), expand_lighted_sight(), get_index(), hit_with_one_attacktype(), kill_object(), knowledge_process_incremental(), lookup_god_by_name(), monster_check_pickup(), monster_do_living(), mood_change(), new_exp(), pets_summon_golem(), pick_up_object(), potion_type_apply(), power_crystal_type_apply(), random_roll(), random_roll64(), recipe_chance(), reportSummon(), roguelike_link_rooms(), save_player(), singing(), time_info(), trap_disarm(), trap_see(), use_skill(), and value_limit(). Referenced by apply_map_builder(), check_inv(), command_use(), deep_swamp_type_process(), food_type_apply(), improve_armour(), improve_weapon(), improve_weapon_stat(), player_attack_door(), poison_type_apply(), potion_type_apply(), prepare_weapon(), scroll_type_apply(), skillscroll_type_apply(), spellbook_type_apply(), treasure_type_apply(), write_note(), and write_scroll(). Definition at line 23 of file compat.h. Referenced by add_object_to_socklist(), apply_savebed(), cast_raise_dead_spell(), cfapi_object_set_property(), choose_cult_monster(), command_cast_spell(), command_create(), command_reply(), command_statistics(), content_recipe_value(), create_player_cmd(), eat_special_food(), enter_map(), enter_player_savebed(), enter_random_map(), enter_random_template_map(), find_ingred_cost(), generate_random_map(), init_dynamic(), kill_player_permadeath(), knowledge_alchemy_attempt(), lighter_type_apply(), load_settings(), make_path_to_file(), map_info(), mapfile_load(), object_matches_string(), player_changer_type_process(), read_map_log(), receive_player_password(), and send_news(). Definition at line 24 of file compat.h. Referenced by hiscore_display(), write_mark(), and write_note(). Definition at line 25 of file compat.h. Referenced by account_block_create(), account_change_password(), account_link(), account_login_cmd(), account_new(), account_new_cmd(), accounts_load(), add_shop_item(), build_stringlist(), cast_spell(), cfapi_system_strdup_local(), check_login(), fire_bow(), include_map_in_map(), init_attackmess(), init_connection(), init_emergency_mappath(), knowledge_god_add(), knowledge_god_detail(), knowledge_god_summary(), knowledge_god_validate(), knowledge_monster_add(), load_dir(), load_map_header(), load_settings(), main(), metaserver2_init(), of_open(), parse_regions(), parse_shop_string(), party_form(), push(), read_bmap_names(), read_client_images(), read_map_log(), send_arch_info(), and spell_consume_items(). Definition at line 10 of file compat.h. Referenced by attack_ob_simple(), cast_spell(), check_login(), check_pick(), clean_tmp_files(), command_nowiz(), compare_ob_value_lists_one(), did_make_save_item(), fix_object(), flush_old_maps(), generate_monster_arch(), generate_monster_inv(), god_enchants_weapon(), god_gives_present(), is_valid_faceset(), key_confirm_quit(), kill_player(), kill_player_permadeath(), load_settings(), LOG(), metaserver2_init(), object_set_value(), object_set_value_s(), parse_dialog_information(), process_events(), process_players1(), rangetostring(), receive_player_password(), save_player(), scroll_failure(), scroll_type_apply(), server_main(), set_object_face_main(), set_object_face_other(), SP_level_spellpoint_cost(), spellbook_type_apply(), START_TEST(), and swap_map(). Simple function we use below to keep adding to the same string but also make sure we don't overwrite that string. dest string to append to. [out] curlen current length of dest. Will be updated by this function. maxlen maximum length of dest buffer. Definition at line 346 of file porting.c. Referenced by display_motd(), query_base_name(), query_name(), query_short_name(), send_new_char_info(), send_news(), and send_rules(). Finds a substring in a string, in a case-insensitive manner. s string we're searching into. find string we're searching for. pointer to first occurrence of find in s, NULL if not found. Definition at line 284 of file porting.c. Definition at line 200 of file porting.c. Referenced by add_map_to_quest(), add_one_item(), add_region_link(), add_required_parameter(), add_type_to_attribute(), command_quest(), copy_attributes(), create_npc_info(), define_quest(), do_map_index(), do_template(), duplicate_attribute(), ensure_map_in_memory(), find_maps(), find_skill_by_name(), fix_map_names(), fix_tiled_map(), get_attribute(), get_attribute_for_type(), get_description_for_attribute(), get_map_info(), get_quest_info(), get_race(), get_slaying_struct(), initmessage(), main(), matches(), metaserver2_init(), opendir(), parse_dialog_information(), process_map(), read_ignore_list(), read_type(), set_disable_plugin(), write_map_page(), and write_quests_page(). Definition at line 365 of file porting.c. Do not use this function for new code, use tempnam_secure() instead. Used to generate temporary unique name. Definition at line 52 of file porting.c. References F_OK, getpid, MAXPATHLEN, and snprintf. Referenced by save_map(), and tempnam_secure().